Established in 1977 by the Bergen Volunteer Center, the CHORE Volunteer Handyman Service helps Bergen County, New Jersey residents 60 years and older, and/or adults with permanent disabilities, remain safe in their own homes by performing minor repairs for only the cost of parts. Repairs include installing grab bars, railings and smoke detectors; minor plumbing/electric, weather stripping, light bulb changes, etc. The program enables seniors with financial challenges and individuals with disabilities live more safely and independently, while avoiding costly and often unwanted institutionalization. As CHORE volunteers are all retirees, the program is dual purpose as it provides truly rewarding and meaningful volunteer experiences. There are currently 44 CHORE volunteers, average age of 70, who utilize life skills developed from maintaining their own homes. Through grants from the County Division of Senior Services, and Community Development, and support from local corporations, foundations and individual donors, CHORE crews travel to clients every working day of the year in three vans. CHORE serves about 1,400 clients each year, and in the past 41 years, we estimate CHORE has helped more than 50,000 older residents. Approximately 89% of CHORE clients are low income, which is alarming considering Bergen County is one of the most expensive places to live in the country. In comparing Bergen County seniors’ actual incomes to the NJ Elder Economic Security Index, 60% of single elders and 28% of elder couples in Bergen County fall above the poverty line; yet these aging residents lack the basic resources required for health and safety, including household repairs.We help our most vulnerable residents remain safe in their beloved homes. Other project lead: Bergen Volunteer Center--Non-profit agency. CHORE Program is a combo of staff and volunteers. 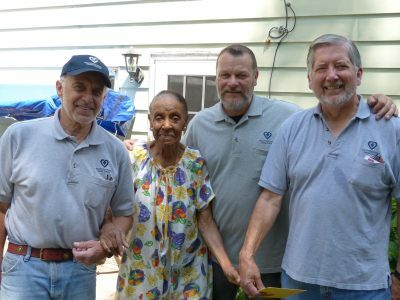 How collaboration worked: The Bergen County Division of Senior Services has funded CHORE since its inception in 1977, when it was determined that Bergen County should provide this home repair service for its older residents. In addition to this county funding (36% of the total budget), the Bergen Volunteer Center continually fundraises to individuals, corporations, and foundations. Home health agencies, hospitals and physical therapists are an integral part of our outreach to older residents, especially those who have had hip or knee replacements. The home health care professionals perform an assessment of the patients’ homes, and if grab bars or additional banisters are needed, the professionals refer the patients to CHORE. Organizations such as Women’s Clubs, Lions’ Clubs, Senior Citizen centers, etc. are also places where we educate their members of the existence of CHORE. Of course, CHORE is reliant on dedicated and talented volunteers who perform the actual repairs, and who provide feedback on ways to improve the program. The relevant services and ancillary organizations frequently utilized in combination with the CHORE Service include the Division of Senior Services, Division on Disability Services, Bergen EASE, Division of Community Development, senior centers throughout the county, American Red Cross/Safe Housing, Home Health Aide Organizations, HIP (Heightened Independence & Progress), Meals on Wheels, Adult Protective Services, Senior Moves and Elder Law. We also refer to and receive referrals from many physical therapists, hospitals and doctors’ offices, as well as departments of health in local municipalities, and other social service providers. We routinely receive referrals from all of these agencies and we often refer CHORE clients to these services, depending on the specific need of the specific client. Details on older people's involvement: In 1977, the Retired Senior Volunteer Program of the Volunteer Center provided the guidance and the volunteers who initially used their own cars to visit the dozen or so clients that were scheduled in the early days. Through their experience and feedback, we developed a protocol of scheduling clients, assessing their repair needs, and matching those needs to the abilities of the volunteers. Today, with three vans and 45 volunteers (average age of 70), CHORE serves up to 15 clients a day. We obtain client satisfaction feedback on a regular basis. Every month, 10 clients are selected at random from the database of current CHORE clients. These 10 clients are sent a double-sided postcard with an evaluation form on one side that they fill in, tear off, and return to us. Postage is pre-paid so there is no charge to the client. The return on these evaluative postcards is nearly 100%, and we are so proud to report that nearly 100% of the comments are highly favorable. See Feedback above. Additionally, we have a site inspection each year, conducted by the Division of Senior Services. The inspector reviews our procedures and policies in detail, and visits a client to secure to secure his/her feedback about our services. Last inspection was favorable. We get many notes of appreciation from clients, along with donations. Here is a sample: Thank you for the stairway railing CHORE volunteers installed several months ago. The other day, I slipped on the stairs and if it wasn’t for the railing, I surely would have been badly injured. Thank you for keeping me safe. Mrs. W. I wanted to thank you for the kindness and quick-thinking of your CHORE volunteers. The other day, they were doing a repair for my mother, who is 90 years old and lives alone. She was experiencing shortness of breath and was having difficulty breathing. The CHORE volunteers quickly found her nebulizer and stayed with her until I arrived. Thank goodness they were there and knew what to do! Mrs. T Once more you have come to my rescue. Thanks to the grab bars you installed, I am now able to visit parts of my home that I have not seen in over 5 years. Many thanks to the crew for making this possible. Mr. M.
Our community outreach is ongoing through newspaper/social media releases, our website, and through speaking engagements to community groups/religious organizations. This outreach has netted more first-time clients who benefit from our services. With adequate funding, we will upgrade our current scheduling software to accommodate a fourth van. Additional funding will also purchase and outfit the fourth van and provide additional staff to coordinate the program and recruit volunteers. During the past 41 years, the CHORE program’s policies and procedures have been constantly tweaked to reflect changes in the volunteer force and the types of jobs requested. There is no major aspect of the development of this program that we would do differently. We are not aware of any other program that provides minor home repairs performed by older volunteers for only the cost of parts, to eligible Bergen County residents, and does so 5 days a week, every working day of the year. Last year, CHORE served 1,555 clients, made 2,354 visits, completed 5,193 total repairs and logged 7,171 volunteer hours. One challenge is to recruit handy volunteers. Currently, we place articles in local papers, post on the Bergen Volunteer Center’s website and volunteer data base, and through a newly added “Redefining Retirement” initiative, which is an effort to educate older citizens about the many volunteer opportunities available throughout Bergen County. Another ongoing challenge is balancing the needs of the clients with the abilities of the volunteers. Some repair work requires the use of high ladders, like gutter cleaning, which would be unsafe for our aging volunteers and therefore prohibitive. Other times, particular volunteers and volunteer crews are better capable of performing particular repairs, which makes effective, ongoing communication with the crews essential.